Mark's note: Today is the first of what might be a regular series of guest posts from the team at Lean Pathways, Inc., including Pascal Dennis and Al Norval, the leaders of that group. 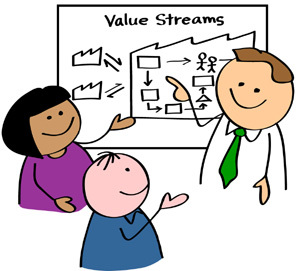 Lean is about providing value to our customers and to do this we look at our Value Stream, which is the sum of all activities which go into providing these goods and services to our customers. The Value Stream extends all the way from our suppliers right through to our customers and include all the steps in between such as Planning, Distribution and Logistics. We know that in these value streams the value added time is very small often just a tiny fraction of the total lead time of the process. If this is the case, why do so many organizations work very hard at reducing piece price of purchased raw materials by bashing, threatening and coercing suppliers? While we all want the benefits of reduced piece price, we don't want it at the cost of larger batch sizes, longer lead times and reduced reliability of our suppliers. In fact, we want smaller batch sizes, shorter lead times and improved reliability in addition to reduced piece price. Wouldn't it make more sense to work together to examine all the waste in our Purchase to Pay systems and work in conjunction with our Suppliers to reduce the waste? Rather than fighting over a piece of a small pie, why not work together so we each get a larger piece of a larger pie? A true win-win for both parties. A great way to get started is to do kaizen with your suppliers. I've done this with many suppliers where we bring them in for a day and do a Waste Walk looking at the Purchase to Pay process. Inevitably, we find many things that we can fix on the spot to the benefit of both parties. Quantities per unit, packaging and product protection a just a few examples. One example that sticks in my mind is a fabricator where the steel being ordered wasn't a standard length and the supplier had to run it at the end of the week leading to longer leadtimes and extra cost. The fabricator trimmed the steel much of the time so by adjusting the order to a standard dimension both parties eliminated waste and gained. A much better process than beating each other up. Lean Pathways helps progressive organizations implement the Lean Business System for breakthrough performance. Lean Pathways has developed a proven transformation model that roots Lean thinking in all areas of the organization. We have supported successful transformations in manufacturing, health care, construction, the process and service industries. Great point! I think that Toyota, as usual, takes a fairly solid approach with this. They’ve been known to visit suppliers on a regular basis and only sign contracts with firms willing to cooperate on lean initiatives. At the end of the day, management committment to being lean even when it’s uncomfortable or unpopular is key. It’s generally accepted in the auto industry that Toyota is more collaborative with suppliers than the old “Big 3” were. I wonder how Toyota gauges a potential supplier’s “willingness to cooperate”? I mean how many suppliers would tell Toyota, “no, we aren’t going to follow TPS”?? How many don’t (or can’t) follow through on that promise? I’m sure they lose Toyota’s business? From what I’ve heard (and I could be wrong; the closest sources I have are a few books and a colleague I worked with who used to work at NUMMI) Toyota will tour supplier plants themselves. Once they’ve decided that a supplier has potential, they’ll test the company for a period of time by having them supply parts for a very small amount of their inventory. Gradually they’ll be integrated with the rest of the company. Granted some can’t follow through, but that’s usually determined early on in the process. Companies have plenty of reasons to adapt though; lean is good for the bottom line and Toyota is a large account. NUMMI would typically be selected as an experimental site for parts suppliers, but Japan would be used to test technology changes (robots, software, etc.) since there was a consensus in the company that the Americans were newer to lean and more likely to revert to old ways of doing things or laziness because of technology. I’m certainly not saying that Toyota was against new technology, just that they made sure the technology fit the company philosophy.